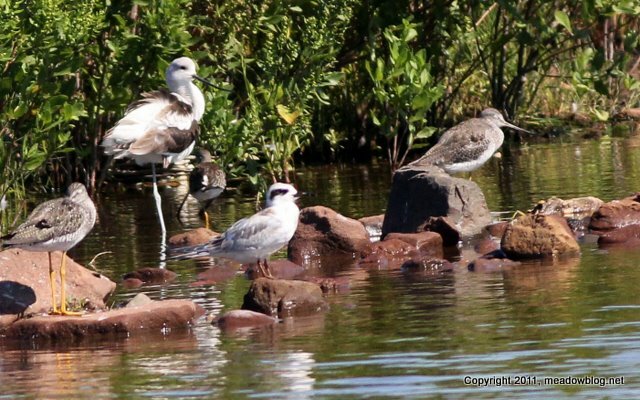 The N.J. Meadowlands Commission's next free guided nature walk with Bergen County Audubon is DeKorte Park this Sunday, Sept. 4, beginning at 10 a.m. Although the Marsh Dicovery Trail will be closed, there still should be good birds around. 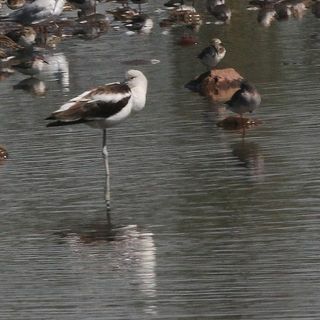 The American Avocet is in Harrier Meadow for a third day. We are taking folks out to see it at noon today. The meadow is otherwise closed to the public. Call Jim Wright at 201-469-7349 if you plan to attend. "During my walk thru Dekorte Park on Thursday, I stumbled upon two pair of baby (snapping?) turtles. 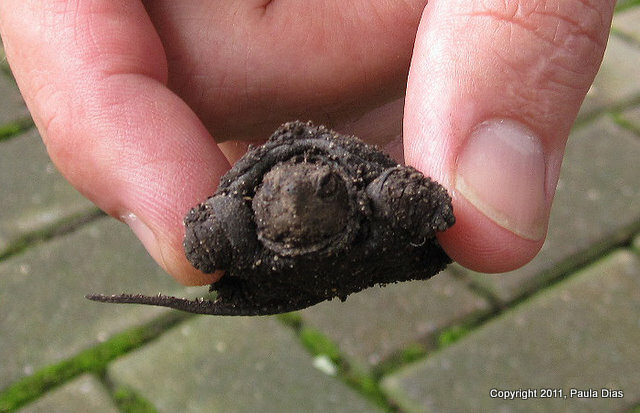 At first they just looked like mud clumps, but then saw they were turtles! They were on the path, facing away from the water, headed for the road! 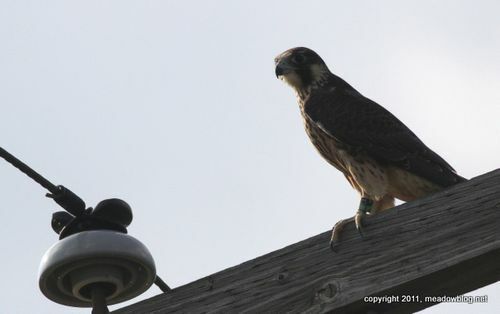 This young Peregrine Falcon is one of four birds on the State's Endangered Species List that nest in the Meadowlands. Endangered ( 4): Pied-billed Grebe, Peregrine Falcon, Least Tern, Northern Harrier. Threatened (4): Osprey, Savannah Sparrow, Yellow-crowned Night Heron, Black-crowned Night Heron. Special Concern (10): American Kestrel, Barn Owl,Brown Thrasher, Common Gallinule (moorhen), Common Nighthawk, Horned lark, Least Bittern, Saltmarsh Sparrow, Spotted Sandpiper, Virginia Rail. It's almost as if Don Torino — who leads a lot of the free nature walks that the Meadowlands Commission and the Bergen County Audubon Society offer every month — knew that an American Avocet would show up at Harrier Meadow this week. We hope you'll join us next weekend, September 10 & 11, at the 8th Annual Meadowlands Festival of Birding at the Meadowlands Environment Center in Lyndhurst, NJ. 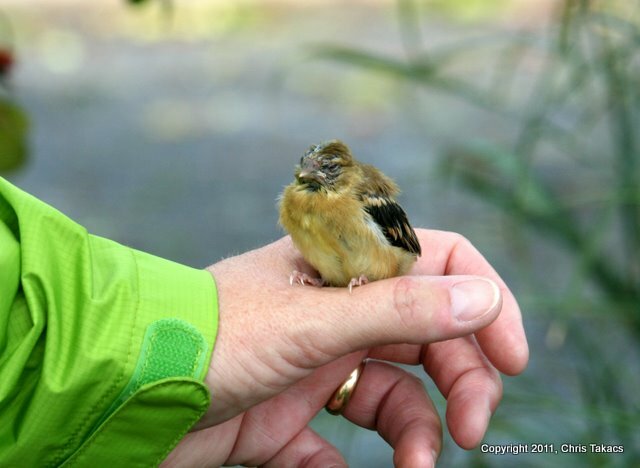 This is a really nice event that can either introduce you to the wonderful world of birds, or simply be an opportunity to search for migrating birds in a beautiful setting in the company of some of the region's best birders! Full info follows. Link to Riverkeeper's Festival Page is here. The American Avocet was again seen at Harrier Meadow this morning (Tuesday) just after 10 and was still there as of 11. (Photo above is from this morning, amid a juvie Forster's Tern and some yellowlegs.) Also seen: Osprey, Falcon sp., Redtail, Gadwall, egrets and peeps. Boblink were seen by some of us. Anyone interested in a lunchtime look for the bird on Wednesday should contact Jim Wright: jim.wright (at) njmeadowlands.gov. Someone asked us recently how many species of birds on the state's Threatened and Endangered lists nest in the Meadowlands. Do you know how many, and what species? 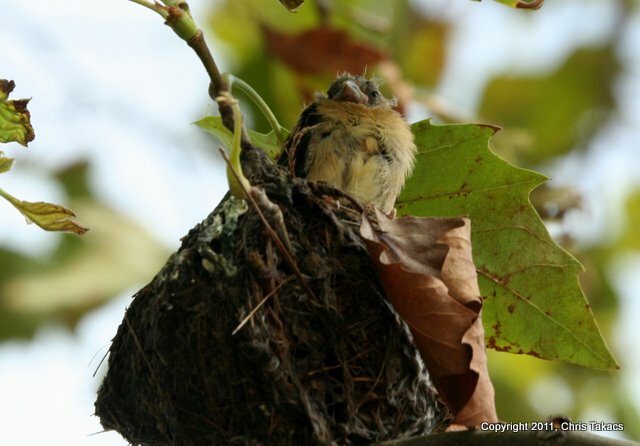 What about nesting species on the state's list of birds of Special Concern? (Another nesting species was added this summer.) Do you know how many, and which species? Answer, and our eternal admiration to whoever gets it right, tomorrow. 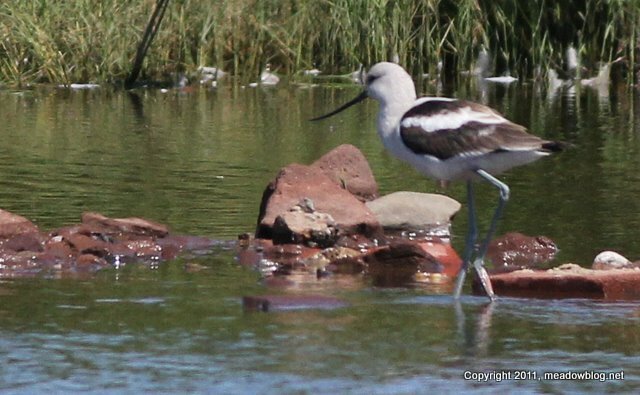 NJMC Naturalist Mike Newhouse and Chris Takacs saw this American Avocet in Harrier Meadow today. Harrier Meadow is typically closed to the public but if the bird continues, we will have an informal walk tomorrow (Tuesday) at 10 a.m. If the bird is not there, we will post something on the blog by 9:15 a.m. You can also call NJMC staffer Jim Wright's cellphone at 201-469-7349 after 9 a.m.